If you have thin spider veins or tangled, thread-like veins (telangiectasia) — particularly on areas such as your face, ankles or knees — and are looking for a quick, effective treatment to reduce or eliminate them without any downtime, consider the VeinGogh procedure. Depending on the size of the area to be treated, a treatment session can range from 1 minute to 20 to 25 minutes. VeinGogh is minimally invasive and virtually painless. What’s more, no anesthesia is needed. What’s involved in the VeinGogh treatment? We first clean the area to be treated. One of our VeinGogh specialists then uses a very fine, insulated needle to administer the treatment just beneath the skin surface. The needle delivers high-frequency electrical energy to selectively targeted spider veins. Because the procedure uses a hair-thin probe, you will only feel a slight “pinch,” if anything, and the skin won’t be harmed. Some patients report that the treatment feels similar to a hair being removed. The tiny problem veins are destroyed and disappear quickly. What can I expect during recovery from VeinGogh treatment? Following treatment, you may have some mild, temporary redness. You can resume normal activities immediately after your procedure, and no bandages are required. What are the results from VeinGogh treatment? You will begin to see results immediately, and you’ll see continued improvement over several weeks as your body reabsorbs treated vein(s). Generally, only one treatment is necessary. However, depending on the severity of problem veins, a follow-up treatment may be needed. VeinGogh-treated veins should not come back. But, new veins may develop over time. These new problem veins can be easily treated with follow-up “touch-up” sessions. 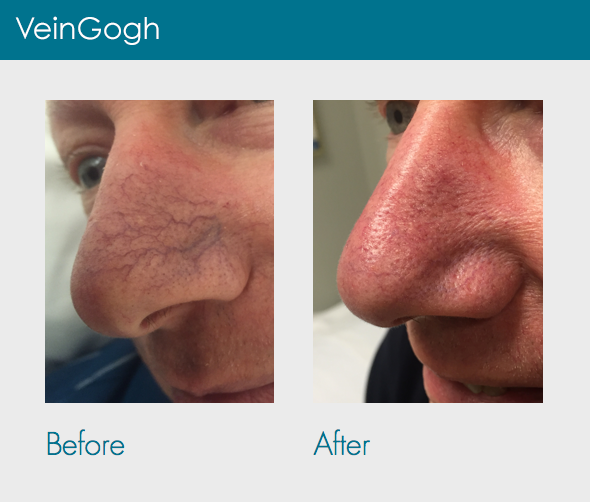 To see what the VeinGogh treatment has done for other patients, visit the Results section to see before-and-after photos. Interested in the VeinGogh treatment? Give us a call at (225) 442-9663 or request an appointment online now.